. sennin 仙人 immortals, hermits - Introduction .
. 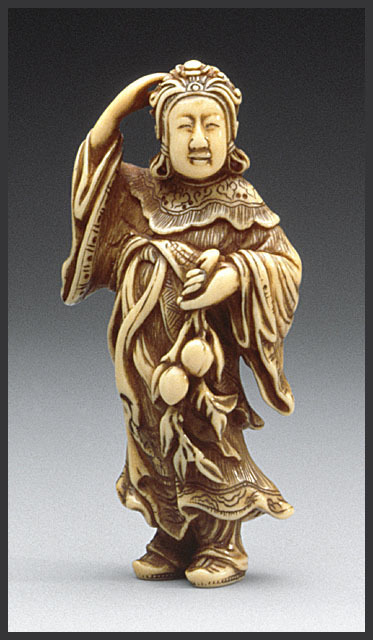 Eight Immortals 八仙 Pa Hsien from China .
. Netsuke with Daruma san .
. Amulets in the form of a netsuke 根付お守り netsuke omamori .
. Gama Sennin 蝦蟇仙人 "Toad Immortal" . 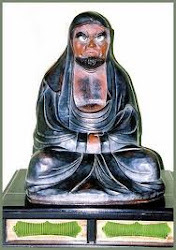 Bashiko, another Taoist immortal, is considered by the Japanese to be the first veterinary surgeon. He supposedly lived in China in the years 2697-2597 B.C. and cured a dying dragon by operating on its throat. 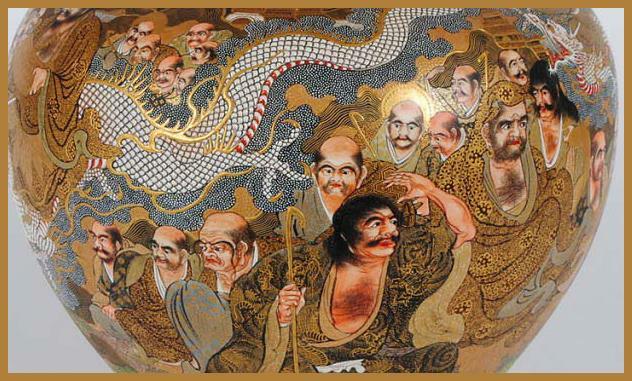 Bashiko is rarely depicted in art, while another Taoist sage, Chinnan, is more popularly shown with dragons. Chokaro traveled a lot and had an elegant solution to the transportation problem. He had a magic pumpkin. He only had to blow into the pumpkin and out of it came a horse. Chokaro therefore is always shown with a pumpkin of which a horse is peeping out.
. Kinkoo 琴高仙人 Kinko Sennin - Qin Gao. Kinko, who lived beside a river and was a painter of fish. One day a giant carp offered to take him for a ride into the realm of the immortals. He returned after a month, telling his followers never to kill another fish. He then jumped into the river, where he was transformed into a carp himself. Kinko is usually shown reading a Taoist scroll while riding on the back of the magical fish. Sennin Koshohei with a short stick in his hand leaning slightly over a small rock that turns into a goat. Koshohei led a herd of goats to the mountains and stayed there for 40 years in meditation. His brother found him after all that this time and was wondering where the goat were. Koshohei touched the boulders around him with a stick, and they turned into goats. "Sei-o-bo" (Si Wang Mu, Xiwangmu in Chinese. Queen of the West). The Taoist deity who lives in Konron (Kuen Lun) mountains. She cares for the mythical peach tree which bears fruits every three thousand years. Eating this peach bestows immortality. According to the legend, Tobosaku stole and ate the peach and made himself "sennin". Tobosaku is the bad guy in the Japanese mythology who stole not only one, but three peaches out of Seibo's garden. So he became immortal. No wonder that Tobosaku is always shown as an old man, with a broad smile and a peach in his hand. Happy old man! 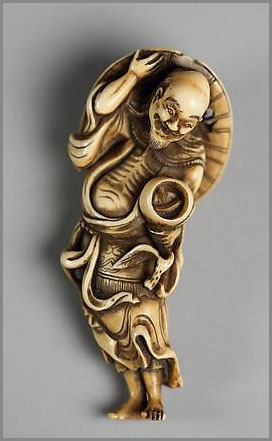 Sennin Tsugen mit zotteligem Haar und langem Bart fröhlich lachend in tänzerischer Pose mit Astknotenstab in der Rechten, an dem hinter seiner Schulter eine Kürbisflasche hängt.
. Kooan - 黄安仙人 / 黄安 Koan, Kame Sennin . Kame Sennin 亀仙人 "Turtle Immortal"
. 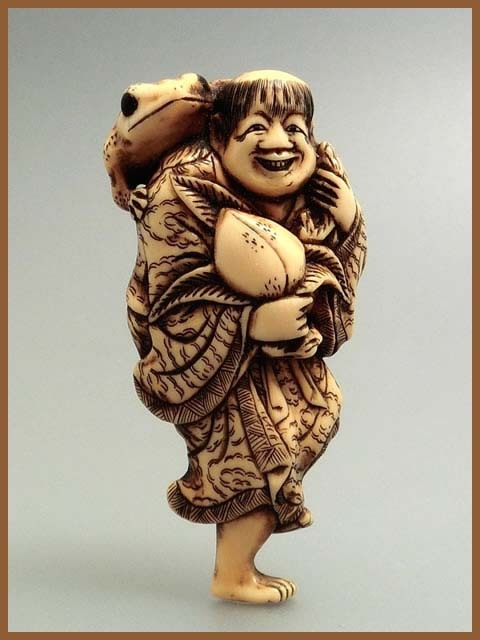 Tsuru Sennin 鶴仙人 crane hermit .
. . . CLICK here for Sennin Netsuke Photos !
. 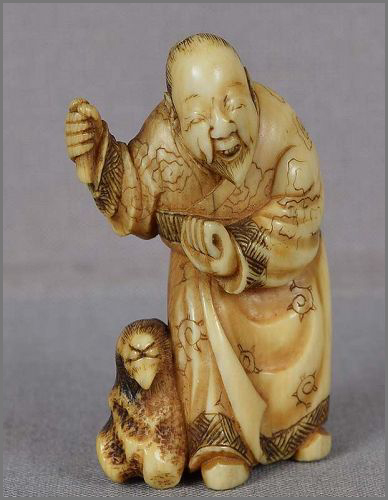 Reference - netsuke immortals .
. Join the Sennin on facebook ! .